Ready Made Drapery Toronto How to choose wisely - Website of draperykingtoronto! 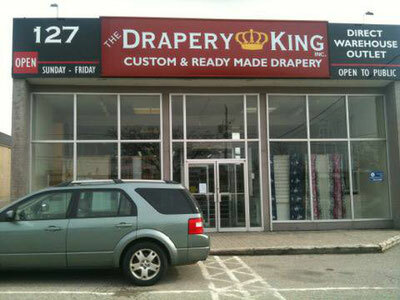 Remember the old ad, “It’s worth the drive to Acton”?...well in this case, WITHOUT A DOUBT, it is DEFINITELY worth the drive to The Drapery King at 127 Cartwright Avenue, Toronto, just adjacent to the west side of Yorkdale Mall off Dufferin Street. We just couldn’t believe our eyes the first time we came here—-the store is just filled with selections for ready-made drapes or curtains in every size, colour & pattern imaginable & the materials available for custom made are endless. Mark is the pleasant owner & Guida is truly amazing in every way...that sweet gal certainly knows everything there is to know about drapery & she dedicates herself to helping you find exactly what you are looking for. All you need is your measurements & you’re on your way to amazing window decor at amazing prices! Guida happily guides you through choices once she knows your style & colour preferences & you have her undivided attention to assist you. We have visited & purchased beautiful drapery (& accessories) from this giant store many times & have nothing but the highest praise & appreciation for the quality, knowledge & personal attention you receive here.